Asheford appraisers join national antique publication as "appraisal experts" columnists. Antique News -The Asheford Institute Of Antiques (AIA), the world’s foremost school on antiques, collectibles and appraising, has added The Journal Of Antiques & Collectibles (JOAC) to it's roster of publications that currently use the school's graduates as expert appraisers for their write-in columns. In an agreement brokered earlier this year, the Institute will now be providing The Journal Of Antiques & Collectibles (in addition to Antique Trader), with its top graduates to work as a rotating team of expert appraisers - answering any number of questions from the papers readership about antiques, collectibles and memorabilia. As part of the rotating appraisers program, readers of The Journal will now also receive top-notch expert information and advice from a variety of Asheford appraisers, when submitting queries and comments to the publication. "It's a super opportunity for all involved..." said Charles Green, director of the school, "We know how great our appraisal graduates are, and what they've done for the readers of Antique Trader, so we're really excited to see this program expand out into the pages of The Journal as well." Both publications stated that their decision to use Asheford appraisers had been largely based on the high degree of professionalism they'd received from the school's appraisers in the past. As with Antique Trader, subscribers to The Journal will also be able to send their questions and photos directly into the editorial staff via mail or email, who will in turn forward all inquiries to the Institute. The selection process for choosing which appraisers will represent Asheford in the various columns has been an ongoing process, and according to Green, "A fairly lengthy procedure. We've got a database full of expert appraisers, so choosing who gets added to the roster can take a little time, but so far we've been happy with our choices." The Journal also released a statement stressing that it was delighted to have the Institute and their team of expert appraisers on board with them, as they've had a great working relationship with the school in the past, and thought this might be a good way to continue building on that connection. "We're excited to showcase our Appraisers Corner column, and bring readers insights from some of Asheford's top appraisers... we think it'll certainly help them get the answers they need - and from a source they can trust." Columns are already rolling off the press, and according to Journal spokesperson Judy Weaver, should be coming online in the next little while. 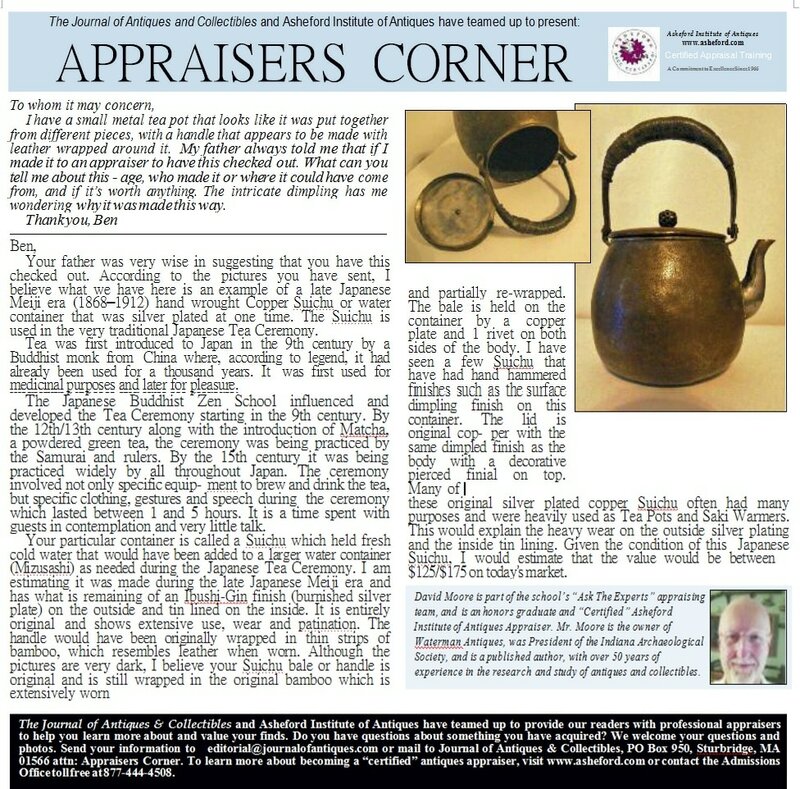 In the meantime, readers can view the latest PDF version of the Journal's, Appraisers Corner just below.